I have moved to Bolivia NC in May of 2018. 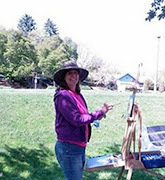 I hope to be out painting soon! If you should need to contact me my e-mail is tina.madonia@gmail.com and 610-504-4528.